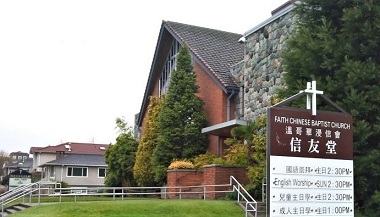 This picture of Faith Chinese Baptist Church at 52nd and Fraser was used to illustrate the Faith and Immigration report. A study released July 9 confirms what anyone watching the church in Metro Vancouver already knows – that many immigrants have found welcome and support from local faith communities. A comprehensive public opinion study of new Canadians – a partnership between the Angus Reid Institute and Cardus – suggests immigrants often seek and find help, both temporal and spiritual, from Canadian religious communities. These communities are evidently integral in new Canadians’ journeys into their new lives in this country. “I’m not sure Canadians appreciate the story of what faith communities do,” says Ray Pennings, Cardus’s executive vice-president. “They actually play a pretty significant role in our day-to-day life.” . . .
“They don’t know anyone, so they go to their church, synagogue, temple or whatever, and that’s where they find people,” says Angus Reid, chairman of the Angus Reid Institute. The survey, Reid says, didn’t differentiate between services from religiously based organizations and those provided directly from congregations. The Faith and Immigration study reinforces earlier research. The aftermath of the war brought an influx of German immigrants to Sunset, who founded quite a number of churches – Mennonite, Mennonite Brethren, Lutheran, Roman Catholic and Baptist. David Ley, head of the Geography Department at UBC, co-authored a study detailing the under-appreciated role these (and other immigrant) churches had in providing vital settlement services. 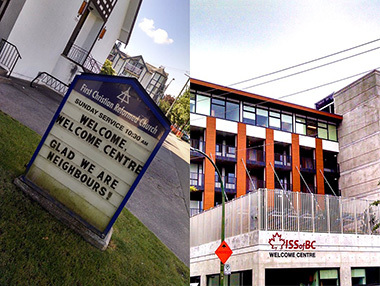 Recently, those same churches have grappled with Vancouver’s new multicultural reality. Go here for the full 36 page study. The congregation of First Christian Reformed Church – which is right next door to the building site – has been looking forward to the completion of Welcome House. The facility is a project of ISSofBC (Immigrant Services Society of BC) and will be an effective focal point for the agency’s wide-ranging activities throughout Metro Vancouver. Up to 200 refugees at a time will be processed through the centre, living there for the time needed to prepare the newcomers for turnover to their sponsoring agents. Trevor Vanderveen, First CRC’s co-pastor for the past eight years, along with his wife, Julia Prins-Vanderveen, sees the new centre’s adjacency to the church as an “opportunity for spiritual and volunteer support.” . . .
First CRC was founded by Dutch immigrants in 1926 and saw much of its growth in the years immediately following World War Two. “Many of those immigrants, while not refugees, came here with little money. They share the trauma [of the contemporary refugee],” he points out. Today, the church is about 60 percent Dutch background with other immigrant groups, including Chinese and Korean. Go here for the full story. The Welcome Centre was completed almost exactly two years ago. There are so many other examples of Christians offering a warm reception for immigrants, from groups that work with asylum seekers such as Kinbrace, Journey Home and New Hope to Chinese churches welcoming Mandarin-speakers from China and the Salvation Army providing a broad range of services. Hundreds of churches and ministries are involved. Go here for a very partial overview. Go here to read the Angus Reid Institute report on Faith and Immigration. ← Around Town: Flavours of Hope, banned in New West, can we evangelize? . . . The choice of the photo of the Faith Chinese Baptist Church is more appropriate than appears at first. The FCBC shares the building with another immigrant group from decades earlier, Ebenezer Baptist Church, whose congregation built the building. They are part of the North American Baptist denomination, most of whose original families immigrated from Germany.